For more than twenty-five years, James Reasoner has been spinning tales about the American West. His novels and short stories have garnered praise from Publishers Weekly, Booklist, the Library Journal, and the Los Angeles Times, as well as appearing on the New York Times and USA Today bestseller lists. The novels, Cossack Three Ponies and Under Outlaw Flags, were nominated for the Spur Award, and Redemption, Kansas, the first book in his most recent Western series, won the Peacemaker Award. One of the most prolific and in-demand Western writers working today, his latest work is considered some of his best. In a special interview for Lowestoft Chronicle, James Reasoner talks about his writing process—from the idea for a story, to the outline, and from the first sentence, to seeing the finished product on the shelf. Lowestoft Chronicle [LC]: You’ve said in the past that you get a lot of ideas for novels from history books, which is why you've done many historical novels. In terms of writing a Western, what is your initial process for starting a new novel — an original novel that isn’t part of a series (yet) and will have your name on the cover? Does the story shape the characters or the other way around? 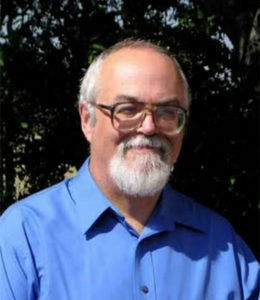 James Reasoner [JR]: Even though I've always thought of myself as more of a "plot guy" than a "character guy," looking back on it, I see that many of my books started with an interesting character. When I started working on my novella, Savage Blood, all I really had in my head was a one-armed bartender, and I worked from there figuring out who he was, what had happened to him, and where he was going in his life. My Judge Earl Stark novels certainly came about because of the character. Of course, if I'm writing something centered around a particular historical event or setting, I start by asking myself what sort of characters would have been there. LC: You once wrote, “In my novels, characters who weren't even in the outline have shown up and played major roles in the books.” How detailed are your outlines before you begin work on a book? How structured are your plots? JR: I've written books from one-paragraph outlines, and I've written books from 60-page outlines . . . and everything in between. I've even written books with no outline, just a general idea. These days my outlines usually run three to six pages, really just a fairly detailed synopsis. I always have the beginning, some of the middle, and the end, although the ending can change along the way. Also, as I'm writing, I have a tendency to make notes in the file itself about things I want to include later on. By the end of the book, I may have a couple of pages of notes like that, tacked on to the end of the text, which then get deleted, of course. LC: You’ve also said that you don't outline short stories. How would you describe your method for writing a short story? JR: Short stories usually get worked out in my head before I start. If I don't have a pretty clear idea of everything that's going to happen, I sometimes get bogged down and can't finish. I have a number of partially written short stories on my computer. And from time to time, I go back and look at one of them and think, "Oh, of course that's what I need to do!" and then I can finish it. 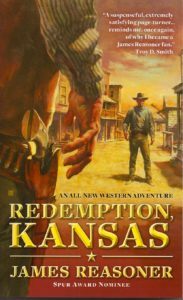 REDEMPTION, KANSAS | James Reasoner | Berkley Books | 2011-03-01. LC: In the case of your Redemption series, there’s a lot of depth and humanity to many of the characters, particularly Eden and Bill. In fact, the first third of Redemption, Kansas (book #1) is largely focused on these two characters and their growing love for each other. Was it always your intention with this series to focus on creating characters that would resonate with the reader or did it just happen that way during the writing? JR: I knew the Redemption series would run for at least three books, so yes, I wanted characters the readers would like and identify with. 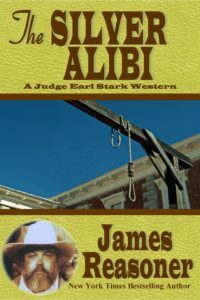 Most Western series set in towns go back to Gunsmoke for their inspiration, with a strong set of core characters who can interact with each other and the other characters who pass through the books. And with Bill and Eden, I got to write about the sort of characters who really hadn't appeared much in my work, a young couple falling in love and getting married. So in a very basic way, the Redemption books are romances . . . with lots of ridin' and shootin', of course. 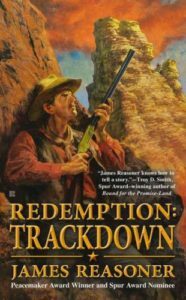 REDEMPTION: TRACKDOWN | James Reasoner | Berkley Books | 2013-03-05. LC: How did this series come about? Had you already started work on the books before the publisher Berkley got involved? Will there be a fourth installment? JR: The proposal for the book that became Redemption, Kansas already existed, so when my agent told me Berkley wanted to see a series idea from me, I pulled it out to see if it would work. It wound up being heavily rewritten, but the basic plot, the town, and the characters of Eden and Bill were already there. The question of whether there will be a fourth book (or more) has yet to be answered, but that should be determined before too much longer. 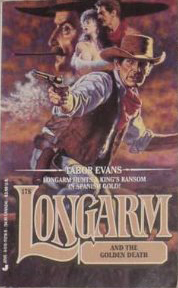 LONGARM AND THE GOLDEN DEATH | Tabor Evans | Jove | 1993-10-01. LC: How would you say your Longarm books differ to those of Harry Whittington, Will C. Knott, and Lou Cameron, who also wrote for the series? Did working off Cameron’s outlines for the first couple of Longarm books shape your writing beyond the Longarm series? JR: I think my Longarm novels probably have more humor in them than the ones by Whittington and Knott, and many of them have stronger mystery elements than the entries by those two authors. In that respect, my Longarms pretty closely resemble those of Cameron, who was my strongest influence in working on that series. But I think my Longarms developed a distinctive style of their own, more influenced by pulps and movies than those of the other authors, and more over-the-top at times as well. By the time I wrote those first two Longarms from Cameron outlines, I had already written quite a few novels, so I don't think they had any real influence on my other writing after that. THE SILVER ALIBI | James Reasoner | The Book Place | 2012-12-22. LC: The novella The Silver Alibi (published December 2012) is the long-awaited new adventure featuring the wonderful Judge Earl Stark, widely considered one of your best characters. With the exception of the short story “Deadlock” (published August 2002 in the Guns of the West anthology) this is the first lengthy Big Earl tale since 1994. Why did you stop writing the series? What made you finally bring the character back? And will there be more Big Earl adventures in the future? JR: There's one other Big Earl story, "'Tis the Season for Justice," in the anthology Christmas Campfire Companion, published by Port Yonder Press. I stopped writing the series because Pocket Books didn't offer another contract after the first three novels, but I've always been fond of the character. I can't reprint the first three novels because the deal for them went through Book Creations Inc. (BCI), the book packaging company I worked for at the time, and BCI still controls the rights to those. But the character belongs to me, so I finally decided to bring him back. Back in the nineties, I had a plot worked out for the next novel, if there had been one, and the title was The Silver Alibi. I remembered that, although the outline is long since lost, and I have no idea what the plot was for that one. So I wrote a brand-new outline for a short novel called The Silver Alibi, and that's the one that was published recently. Projects like this have to be worked in between some of my other commitments, so that's why it's not a full-length novel. However, I do plan to keep spinning yarns featuring Big Earl. There should be at least one more this year. Whether it'll be a short story, a novella, or a full-length novel, I just don't know at this time. But he'll be back, I'm sure of that. 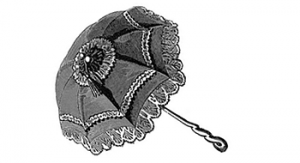 THE DIABLO GRANT | James M. Reasoner | Pocket Books| 1994-12-15. LC: Incidentally, did you ever write the story of the talkative little girl named Mockingbird you allude to in The Diablo Grant? If not, is there any chance you’ll pen the tale? JR: No, I never wrote that one. No plans to, right now, but you never know. 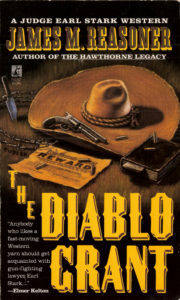 LC: While I am a fan of Big Earl, I think many of the smaller characters in the Stark series are also memorable (like the coarse Sheriff Boone Higgins and the ambitious newspaper editor, Matt Curry, from The Diablo Grant, and the bellicose court judge, Artemus Buchanan, from Stark’s Justice, to name a few). A lot of your side characters in the Stark series seem ripe for more adventures. Did you ever consider bringing some of them back when you brought back Earl? JR: No, those books are too far back in my writing career, and I like the idea of making the Stark books true stand-alones. I sort of miss the days when you could read a series in any order without having to worry about backstory. LC: I remember you saying that the editors at BCI were pretty hands on. How much control did you have over the finished books? Did they ask for a lot of rewrites and changes? Did the workload ever become a problem for you? JR: The editors at BCI were hands-on when it came to outlines. That's why they liked longer, more detailed outlines, so they would have a good idea of what the book would be like and they could tweak it if necessary at that stage, rather than later on. I had a really good relationship with all of my editors there, and while they usually wanted changes in the outlines, they were open to talking about it. Often, if they felt that something didn't quite work, they would suggest some other way of handling that part of the book, then I would come back with a revision of that, and we just kept it up until we had something that everybody liked. While I wasn't fond of writing long outlines, I have to admit the process worked pretty well most of the time. I don't recall ever having to do any major rewrites on a BCI book. They asked me to once, but I felt like the changes they wanted would be a mistake and was able to convince them I was right on most of the points. I didn't have any control over the finished books, however. I turned in my manuscripts and never saw the finished product until it went to the publishers. BCI had a "house style," and I'm sure there may have been some editorial rewriting of my books to make them conform to that style, but probably not much. For one thing, I read a bunch of BCI books in various series before I ever wrote for them, so I had a pretty good idea of how they wanted things done. After my first couple of books, my main editor there mentioned a few things I was in the habit of doing that didn't mesh with their style, so after that, I didn't do them anymore. Pretty simple, really. And as time went on and I wrote more and more books for them, they asked for fewer changes and sort of turned me loose to do what I wanted, within reason, of course. The workload was never a problem as far as I was concerned. At one point, it looked like it might be, which led to me collaborating with Bill Crider on four of the Cody's Law novels, but as things worked out, I probably could have done all of them. I would have missed the chance to work with Bill, though, which was a very enjoyable experience, so I'm glad things went the way they did. LC: During your long and productive career, were you ever in the position of having to work off an outline you thought was lousy or did you always have control over that side? And were there times when you agreed to a book or book series but wished you hadn’t? JR: There have been only a few times when I had to work from someone else's outline: I've talked about the two Longarms I wrote from Lou Cameron outlines, and in two or three other cases, I've stepped in at the last minute to write some house-name books where someone else wrote the outlines. A couple of times, I've written books where not only were the outlines done before I was ever involved, but so were the covers. But it's never been a real problem making my manuscripts match up with the cover copy, etc. I've always been able to put my own spin on the stories, so I didn't mind if the outlines weren't exactly what I would have done with the same plot. Of course, there have been a number of occasions where I've written books from outlines that my wife, Livia, has done, but that's not really the same thing. She knows my strengths and weaknesses and always gives me great stuff to work with. There have been a few jobs I've taken that I wished I hadn't. Once I was hired to rewrite an unsold manuscript. It was a big romantic suspense/woman in jeopardy novel by an unpublished author who was willing to pay to have the manuscript doctored. That job involved rewrite after rewrite, to the point that I began calling it "the book that wouldn't die." I got paid, but I don't think I ever satisfied the person I was working for, and as far as I know, the book never sold. Another time I was hired to ghost a novel for an author unable to deliver on a contract because of health problems. What I didn't know until after I'd written the entire book was that it was already three years overdue and the publisher didn't really want it anymore. That was one I never got paid for, and that book was never published, either. There have been a few other ghostwriting jobs that didn't go very smoothly, but everything worked out all right in the end. LC: I’ve read a number of your Cobb short stories, which have a great supernatural quality to them, or hint of the supernatural, at any rate. Over 25 years, you’ve written only five Cobb tales — the first, “Hacendado,” dates back to 1988. Considering this character’s popularity (several of his adventures have been praised by Booklist, Publishers Weekly, and the Library Journal) why haven’t you written more? What are your thoughts on the character, and do you plan to write more Cobb stories? JR: The first Cobb story I wrote was actually "The Wish Book," which wasn't published until after some of the others were. I really enjoy writing about him, and I've done a story with him for Western Fictioneers anthologies each of the past two years, "Rattler" in The Traditional West, and "Presents for One and All" in Six-guns and Slay Bells. So there's a really good chance he'll show up again, but I sure can't say when. I didn't write more of them in the past because there was really no market for them except when I was asked to contribute to an anthology. I wrote one Cobb story that was never published called "The Smokestack." A pretty oddball story, like the others in the series. But the manuscript was lost in the Big Fire of '08. If I still had it, the story would probably be available as an e-book by now. I remember the plot and could write it again, but I doubt if I ever will. LC: What is your process for determining what the title of a novel/short story will be? Is it an easy decision or a challenge? JR: I'm all over the place on titles. Sometimes they just come to me and that's the first thing I have, and sometimes I struggle all the way through a project to find a good one. And a lot of times, they wind up being changed by editors, anyway. I do a lot of series books where the titles may all be similar, so that gives me a foundation to start with on those books. If I like a title and it winds up not being used, I'm liable to try it again on a different book. LC: How important is the first sentence? JR: One of the first pieces of writing advice I ever read was about the importance of a narrative hook. I like to catch the reader right away and often (but not always) that involves action. If it's not action, I try to come up something that will tell the reader something about the main character right away, something that really catches at least one facet of the character's personality. LC: What stage of writing a novel is most satisfying to you? JR: I'd say starting a novel and finishing one are about equal in satisfaction. I really enjoy both of those things. It's all that stuff in the middle that's hard. I still like the end results, too, and by that I mean seeing the books on the shelves or, in the case of e-books, listed on the various outlets for them. LC: Looking back over your writing career, what have been your highlights, and do you have any regrets? JR: There have been many, many highlights: Opening the box that contained the author copies of my first novel on a sunny October morning in 1980. Being able to make a living as a full-time writer. Having books nominated for various awards and actually winning the Peacemaker Award for Redemption, Kansas. Appearing on some bestseller lists (not under my own name yet, but that'll come, one of these days). The most satisfying thing, though, has been being able to spend so much time with my family over the past thirty years, which I wouldn't have been able to do if I'd had a regular job. As for regrets, I've had an opportunity or two that I didn't take advantage of the way I should have. I was invited to contribute to a series that was very successful for a while. The editor even called me and asked me to send him something. But I had other projects going on, and this was early in my career when I hadn't really learned how to use my time, so I never got around to it. Looking back on it now, the job probably wouldn't have helped my career that much, but I didn't know that at the time. So any regrets I have are minor ones, and they all boil down to feeling like I should have worked harder. Writing under his own name and various pseudonyms, James Reasoner has authored several hundred novels and short stories in many genres. Best known for his Westerns, historical novels, and war novels, he is also the author of two mystery novels that have achieved cult followings, Texas Wind and Dust Devils. His latest novel, Redemption: Trackdown, the third book in his highly acclaimed Western series for Berkley Books, is released on March 5th, 2013. Nicholas Litchfield is the founding editor of Lowestoft Chronicle.